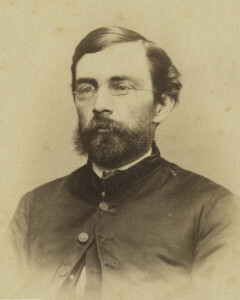 Selah Merrill (1837-1909) a native of Canton Centre, Connecticut graduated from the New Haven Theological Seminary in 1863 and enlisted on June 1 of that year as a chaplain in the 49th U.S. Colored Infantry at Vicksburg, Mississippi. He was ordained at Feeding Mills, Massachusetts in 1864 and returned to the Regiment, where he served until the end of the War. After the war, he studied in Germany, Yale University, Grinnell College and Union College, and taught at the Andover Theological Seminary. He worked in Palestine as an archeologist and served intermittently from 1882 to 1907 as the U.S. Consul to Jerusalem under three U.S. presidents. His attitudes toward Jews and also gentiles who fell out of the Protestant mainstream made him a controversial figure in turn-of-the-century Palestine, but in the U.S. he was considered the foremost American expert on the Holy Land. He was married to third wife Adelaide Taylor in 1875. The couple inherited 97 Main Street, now the home of the Andover Historical Society, from Mrs. Merrill’s uncle Edward Taylor. They lived in the house only briefly, and rented it during their years in Jerusalem to Henry S. Robinson and family. Merrill and his wife both died in California.